DNP’s Party Print allows wedding & event photographers to tap into a new source of income from party snapshots. With a PC, a DNP printer and the Party Print system installed on location, plus a free mobile app for smartphones and tablets (iOS and Android), the business potential is huge! DNP’s Party Print is compatible with DS620, DS40, DS80 and DS-RX1 (available separately). The system comprises of a CD-ROM (with installer software, Party Print screensaver & documentation), a software license key, and a wireless router to accept the photos sent from event guests. It works on current PCs. Your business model as an event photographer is usually a rental model, installing the system including the printer and a set of photo consumables on an event (optionally with graphical border specific for the event). 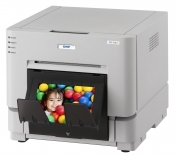 Party Print allows event guests to easily transfer photos via Wi-Fi. • It’s the modern version of free film cameras on the table. Event guests use their mobile devices to capture memorial “candid” shots. • Archives all of the images that it prints. Event hosts can receive copies of the digital files. • Party Print can be customised: Party Print can add a customised graphical border to each print. With Party Print, DNP is the proud winner of the Marketing and Innovation Award 2013/2014! Fun - DNP's Party Print is the modern version of single-use film cameras on the table. Event guests use their mobile devices to capture memorable snapshots. Easy - DNP's Party Print allows event guests to easily transfer photos via WiFi for instant printing and sharing. Download the free app, connect to the local WiFi set up with the enclosed router and print. It's that simple! Archive - all pictures sent to print are being saved in a folder and archived for the event host. Party Print therefore provides instant snapshot prints for guests and lasting memories for the hosts. Versatile - With DNP's Party Print customised borders can create a lasting memory of the event on each print. All of DNP’s dye sublimation expertise in a cost effective printer. DNP expands the offering in the DS series with a low investment solution. Being reliable and made for tough assignments, the DS-RX1 comes at a low investment and with very economic consumables. At the same time it impresses with high print capacity and its compact size. The DS-RX1 is the right choice for integrated kiosks and photo professionals.